As exhilarating as it may feel to reach for that pair of embroidered cowboy boots or powder blue kitten heels, you owe it to yourself to ask yourself this quick question before making any purchases: Does my wardrobe have all the essentials stocked and ready to go? If the answer is no, then it may be a good idea to take your paws off the trend-centric item in question. Sure, essentials like layering tees, socks, underwear, and the like are on the more boring side of the style spectrum, but they're also your bread and butter—the pieces you arguably wear every day that are worth giving some time and thought. That said, it doesn't mean you have to spend your seasonal budget on only basics. In fact, it's quite possible to snag these classics at key brands and retailers that offer them at a budget-friendly price point, which allows for a splashy investment or two. Ahead, see where you can stock up on basics for under $25 this season. 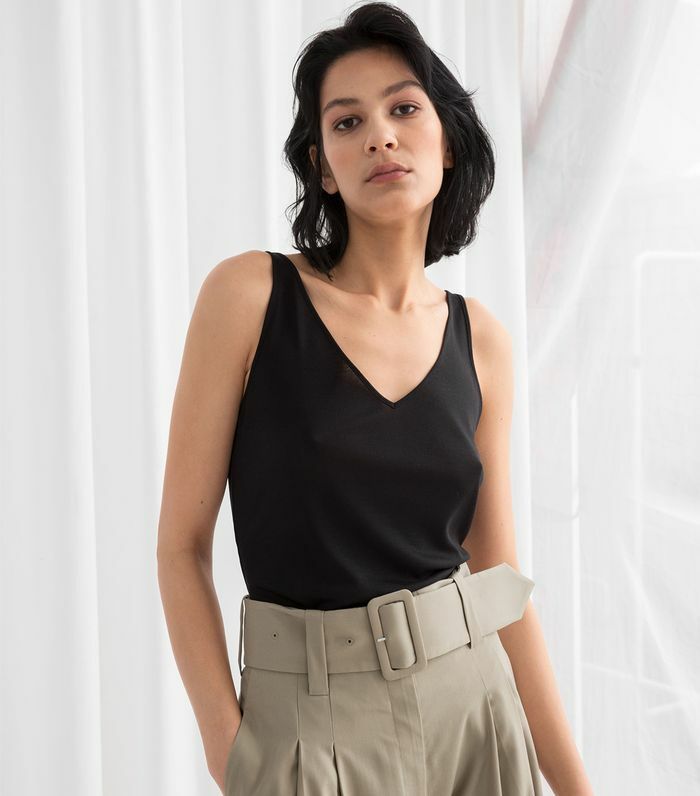 Once your wardrobe is fleshed out, you have our blessing to snag whatever bold pieces you please (here are seven trends to get you started). Whether it's a solid tee to layer with your favorite cardigans and lightweight sweaters or a striped T-shirt to team with blue jeans and loafers, a fresh assortment of simple layering tops is sure to keep your outfit options open. Depending on your sentiments toward undergarments, investing in a new bra or pair of underwear may not qualify as boring in the slightest. However you feel, it's crucial to buy a few new intimates every few months. Thankfully, there are plenty of affordable options that get the job done. You may be tempted to splurge on one of those amazing bedazzled barrettes you've seen all over street style—and you should—but don't forget the power of having a versatile hair tie or clip in the mix as well. They're perfect for workouts, washing your hair, or just pulling your hair out of your face for the day. Even if you're starting to wear more sandals now that temperatures are warming up, your wardrobe still needs at least a week's worth of cute, clean socks. Plus, the short sock styled with penny loafers or low-heel sandals is a charming way to transition from winter to spring. Next up, check out 43 "special" basics to take it to the next level.